I generally steer clear of pantomimes in general, but have inherited a few people and groups that I feel the need and am generally happy to support through thick and thin. 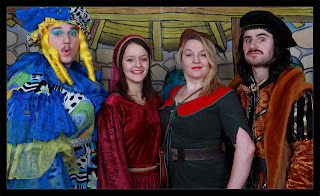 Hence following my trip to Duston Players earlier in December, I found myself back at the annual Looking Glass Theatre's pantomime at St Peter's Church a week or so back (this is a heavily delayed review). Looking Glass do none showy traditional family pantos, there are no awkward moments here of the adult squirming over whether that joke was too near the knuckle for little Johnny sitting next to you. There are though always jokes for the grown-ups, but not in the adult nature, just occasionally newsworthy stuff, and this time among others we had the rather timely Baron Le Brexit as the baddie. This is the third panto I have seen from Looking Glass and without criticism of the previous ones, this is the best. It's a more solid presentation and perhaps most importantly wields the best quartet of a cast. That cast once again are plundered very nicely from this (now last) years graduates of the University of Northampton BA Actors, a constant delight that I at least get to see some of them again beyond Flash and the London Showcase, as so many depart across the country and world beyond, seemingly never to be seen again. The day before I saw this panto, I had rekindled memories of the BA Actors show Blue Stockings in my year review and the quite devastating performance, in a small role, of Stuart Warren, A totally repellent character, made very punchable by Stuart's performance. In Babes, among other characters, he was full on Dame mode as Nursie Nighty. Quite a contrasting performance, and one that he happily completed with ease. Although pantomime isn't always my bag, I concede the fact that if you can nail success at it and the respect and attention of wandering minded five year olds, you can probably do anything on the stage. Like Stuart, Madeleine Hagerty, Connor McAvoy and Penelope May all nailed, or in modern lingo, killed it. Playful, quick witted enough to deal with the audience in a fluid script and keeping us entertained throughout. Connor is a surprisingly likeable baddie as the Baron, Madeleine is a nicely manly Robin Hood (keeping up the gender switching panto tradition) and Penelope makes a charmingly delightful Maid Marion. It is, I have to concede wonderful fun. I still doubt I will ever run to a pantomime in a thrill, however over time I have certainly begun to respect their importance to both a theatres annual budget, and that ease into the world of stage for the grown-ups of the future. Looking Glass offers perhaps the most interactive and accessible of pantomimes that you might find in Northampton each year, and delivers it without the need to be showy and expensive on the pocket of the audience. However is remains as fun an afternoon as you would want from a pantomime at the same time. Performance reviewed: Saturday 31st December, 2016 (matinee) at St. Peters Church, Looking Glass Theatre, Northampton.